My mom made most of my doll clothing that I had as a kid and I always thought someday I'd do the same for my daughter but up until she got Cinderella at Christmas she's never been much of a doll girl. She plays tons with her stuffed animals however. I can't wait for her see the outfit when she gets home from preschool! I'm planning to have the tutorial finished for Thursday. 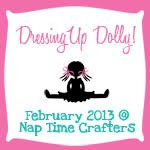 Remember to check out Dressing up Dolly over at Naptime Crafters. Yesterday she had a Mermaid tail for these Disney Princess dolls. Peyton placed an order for one of those after I showed it to her. So cute...my granddaughter (who just turned 10) really wants to sew for her doll. This looks like a fun project. I think if she has sewn some this is totally something she could do.